The European Space Agency (ESA) launched a new probe to study Mercury, which within days had already sent back its first images from space as it begins its voyage across the solar system. From a launch pad in French Guiana, the BepiColombo space probe began its seven year journey to the least studied planet of the inner solar system. The mission is a joint venture between both the ESA and the Japanese Aerospace Exploration Agency (JAXA). The main spacecraft, known officially as the Mercury Transfer Module, actually contains two orbiters. The Mercury Magnetospheric Orbiter is run by JAXA and designed to study Mercury’s magnetic field and how this interacts with that of the Sun, while ESA’s Mercury Planetary Orbiter will be focusing on producing highly detailed maps of the surface of the planet. Jan Wörner, ESA Director General, says, ’Launching BepiColombo is a huge milestone for ESA and JAXA, and there will be many great successes to come. Making the journey to Mercury and then settling into an orbit of the planet will not be easy. 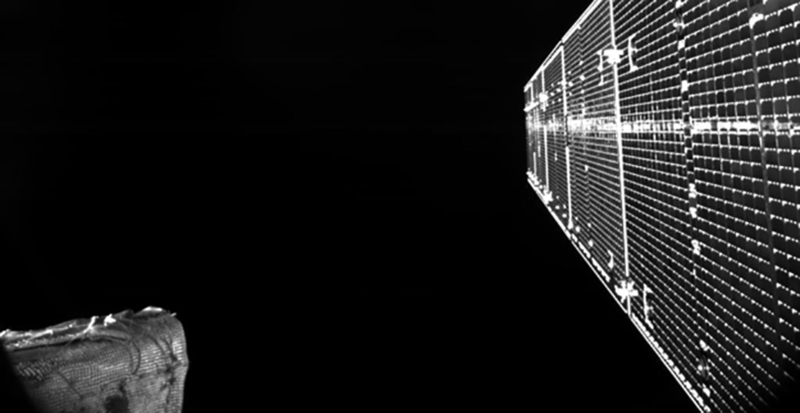 The first image taken by BepiColombo shows part of the two solar arrays designed to help it get on its way, but it will also have to utilise gravity-assist flybys. These complex manoeuvres are part of the reason its journey time is so long. The first flyby will see it slingshot around Earth to build up momentum. This will be followed by another two flybys around Venus and a further six around Mercury, before the probe can enter a stable orbit of the target planet and the full operations can begin. Andrea Accomazzo, ESA Flight Director for the spacecraft, says, ’BepiColombo is one of the most complex interplanetary missions we have ever flown. In addition to the immense gravity that BepiColombo will have to deal with, it will also experience wildly variable temperatures. The orbiters - along with the 16 scientific instruments they carry - have to be able to withstand temperatures that can swing between -180°C to over 450°C. The Mercury Planetary Orbiter has a radiator on board to help deal with this. The Mercury Magnetospheric Orbiter will instead spin 15 times per minute to evenly distribute the Sun’s heat over the craft’s entire surface. BepiColombo is expected to reach Mercury by 2025. Just before it reaches the planet, the Mercury Transfer Module will be jettisoned, and the two smaller orbiters which will be tethered together will then be captured by the planet’s gravity. They will then get into safe orbit through the use of thrusters, before the tether is broken and the Mercury Planetary Orbiter descends to a closer position. From these respective orbits, they will hopefully reveal a host of new information about the closest planet to the Sun, including its internal structure, the evolution of its geological features (including the ice that persists in Mercury’s craters) and its interactions with the intense solar wind the planet is exposed to.